TV show dates: April 21, 2017 — June 24, 2017. Performers include: Britt Robertson, Ellie Reed, Alphonso McAuley, Johnny Simmons, Amanda Rea, Melissa Macedo, Michelle Macedo, Kimmy Shields, Norm MacDonald, Dean Norris, and Richard Wharton. Inspired by Nasty Gal founder Sophia Amoruso’s autobiography, #Girlboss, the Girlboss TV show follows Sophia (Robertson). By the time she was 28 years old, Amoruso was the head of a multi-million dollar brand. This successful young woman got her humble start auctioning off vintage clothing on eBay. The comedy series kicks off in 2006 San Francisco. Sophia is a rebel and an anarchist. She is also the personification of the Peter Pan complex. Although undisciplined, foul-mouth and self-absorbed, she does have a knack for finding bargain basement items and reselling them at a profit. After realizing she has an innate sense for e-commerce, Sophia’s passion gives birth to a viable business. As she gains success, she grows to appreciate both the challenge and worth in being her own boss. What do you think? 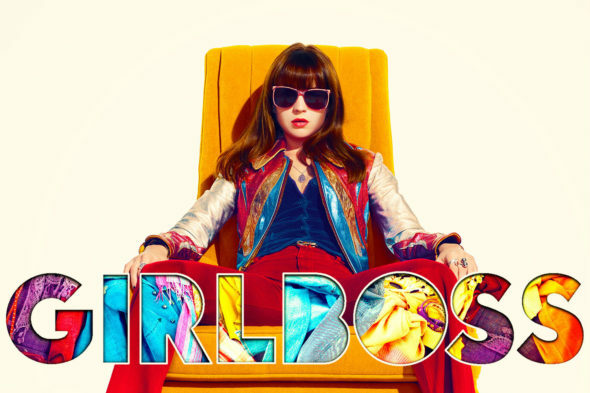 Do you like the Girlboss TV show? Should it have been cancelled or renewed for a second season on Netflix? I like the show. It should come back!! I AM twice (the main character) Sophia’s Age and love this show!! I think its inspiring to young women (especially the way her character handled her website launch and break-up!). So, Boo on canceling it after Season 1. I’m probably too old to have enjoyed this show so much. It’s raunchy…… in such a funny way. Love the show, will be interesteing to see the writers take it next.